Last weekend the "Fall Back" has all of us in the dark earlier in the evening. I'm still taken by surprise by how soon the sun starts to fade and the house is suddenly dark. For the first time I put timers on some of our lights and I love how they just come on automatically around 5:00 PM. No need to go around fumbling to get to lights behind chairs or couches. Lighting up rooms so that one can safely navigate and see requires several lights in a room. The best lights are those that are 3 way so that the bulbs can be set at the highest setting. 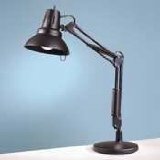 Under cabinet lights for working in the kitchen, swing arm desk lamp for writing bills, or a goose neck floor lamp for reading in a chair are just some of the types of lighting that make it easier to perform every day activities.